Daniel and I went to Daventry Country Park,yesterday,looking for photo opportunities.We spent ages walking around the reservoir. Many thanks for all your comments and Favs,always much appreciated. wow fabulous capture Carol, love the blue colour and the detail in the wings. 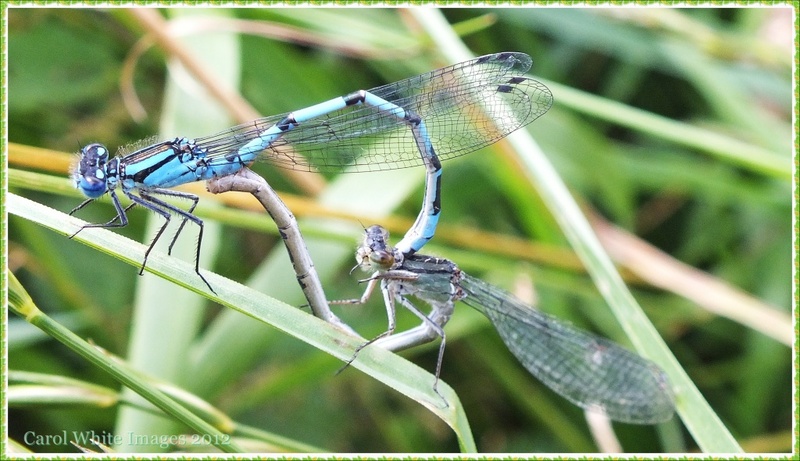 Oooh, mating damselflies! Totally cool shot! Cool shot...don't you like how they form a heart! Speaking of "FAV"s, Carol, this is great! Since childhood I have always been fascinated by dragonflies. In New Orleans where I grew up, we called them mosquito hawks. Great capture of these beautiful creatures. Fantastic capture - you keep inspiring me! An amazing capture, Carol ... beautiful clarity!! Amazing capture Carol! That is the one dragonfly shot I have been dying to get! I'm soo jealous..haha. Congratulations! This is perfect! This does form a heart. Very beautiful. Does your Mama know the kind of pictures you're publishing? So very delicate, great details and color. yes I can see the formi9ng of a heart.. fav. What a fantastic find, Carol. Sweet pair .... striking blue colors, details and I "heart" the heart shape they have created ;-) Fav! Beautiful shot! Dragonflies are positively balletic when they mate. And right out there in the open! :) Super shot! such a fantastic macro Carol, love the colour too! What a fantastic macro shot, Carol. @glimpses .Thanks for the comment,Leslie,didn't realise it was on pp!! This is an amazing capture Carol in so meny ways...I love the clarity and colors ..but most of all the heart shaped form they have created..together....lovely....fav!